You deserve to be pampered. Restore, relieve, rejuvenate, and relax in our tranquil Breckenridge massage studio. As the owner of Sol Impressions, I would like to personally welcome you to Breckenridge, Colorado. I made this little ski town my home over 10 years ago while pregnant with my first son. I’m pretty sure that there is a gigantic magnet that draws travelers from all over to these majestic mountains. It certainly pinned me down! I was a woman of wanderlust and worked seasonally all over the globe from frozen Antarctica to the fjords of Alaska back to the rivers of Colorado. My desire to get out into the wilderness mixed with a lanky body inevitably led to chronic pain, which led me to seek affordable massage in Thailand & India. This is where I met the father of my two children who turned out to be a Tibetan massage therapist. We moved to Breckenridge in 2008 and bought Sol Impressions Massage Studio in 2009. It was meant to be that I surrounded myself with healers. It’s because of these passionate practitioners that I’ve grown leaps and bounds and Sol Impressions has grown too. We started as a small one therapy room space and have become a five room therapy studio offering the widest variety of massage modalities in town. In 2012 I became an esthetician and introduced facials to our menu. In 2014 I bought out the whole of the business and took on a new partner and a step-daughter. Through the ups & downs of life & business, while living in this challenged body, what I’ve learned is this: having a healthy mind/body & beautiful skin comes from practicing holistic wellness, so getting massages & facials are two amazing spokes on the wheel of wellness, but the other spokes are necessary too, like meditation, connection, movement, nutrition & alternative medicine. Defeating pain & sickness is really a matter of what you do to help yourself and what choices you make at any given time, so essentially the magic healer of you is you. 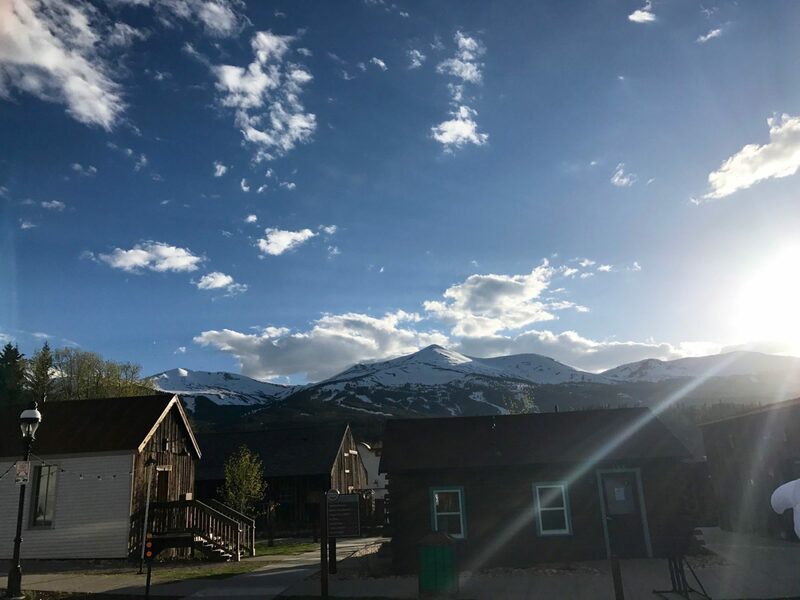 We hope that while you are in Breckenridge, you choose to come see us so that our practice can be an integral part of your wellness wheel. We truly do hope to see you soon! Thanks for reading this bit. Please read my tips below on visiting Breckenridge. Driving: Many of you will rent a car in Denver and make your way along i70 west. It’s a curvy high mountain road. Please keep a few things in mind. Everybody is driving up from the front range (that is what we call everything from Fort Collins to Colorado Springs) on Friday evening and Saturday morning. If you are planning a trip, it might be good to plan on coming up on a different day to avoid traffic. On the other side of that, everyone is traveling back to the front range on Sunday, so expect heavy traffic on that day too. Driving on windy mountain roads may be exciting, but remember… the right lane is the traveling lane and the left lane is the passing lane. Let the more experienced drivers pass while you are negotiating turns and looking at the beautiful scenery! The locals will appreciate that. Be aware of the weather. In the winter, it’s pretty obvious that ice/ snow is the hazard. In the summer it can be hail storms and heavy rain. The best driving advice in bad weather is to drive defensively. Just because you rented an SUV doesn’t mean that it won’t slide on ice! Be sure to rent a 4 wheel drive vehicle and at the very least, a front wheel drive vehicle. Rental car companies tend to have crappy tires, so be extra careful. Don’t take fast turns on icy roads. Don’t break hard suddenly, instead give yourself plenty of room to stop. Beware of shadowed roads. That is where an icy spot may hide. All that being said, if the road is dry, please go the speed limit! Public Transportation: If you decide not to drive, let the locals do it for you. They know how to get around in the weather. There are several shuttles that operate from the Denver airport, like Epic Mountain Express and Peak One Express, which will drop you at the Frisco or Breckenridge Bus Station or take you directly to your door for an extra fee. Once you get here, there are free buses everywhere, so it’s easy to hop on a bus. Uber and Lyft are here too, but service can be spotty at certain times of the day. Many of the resorts and hotels have shuttles that will drop you off & pick you up. Having a car isn’t really necessary if you are planning on staying in Summit County and it reduces traffic & saves the earth, so win win! Breckenridge has experienced a growth spurt over the years. With lodging made easy by Airbnb and other such sites, it’s made short term rentals more profitable than long term rentals. This and the sky rocketing cost of real estate has made it extremely difficult for regular workers & families to find housing. This in turn has put a strain on local businesses who need staff. This strain on the worker and the local businesses inevitably ripples to you, the guest. Workers and business owners may be trying to meet customers needs with not enough staff or with brand new, inexperienced staff. My advice to the visitor is three fold: be patient, be kind & be compassionate. Breckenridge is not a snobby town, it is a friendly, easy going place. Being overly demanding or rude to that waiter or reservationist causes a miserable ripple back into our community. Many of the workers live here for the love of it, but have to have multiple jobs to make ends meet, so please think of that when interacting. Businesses do the best they can to give consistent work and good pay in a seasonal destination, but the off seasons & high costs of doing business here can be a tough balancing act. For these reasons, Sol Impressions has recently raised prices, because we need to pay our workers more so that they can make a life here, it is just that simple. If you are lucky enough to come here on vacation, please show your gratitude to those who serve you. Tips help workers make it, will inevitably improve customer service over time… and they’re so appreciated! Breckenridge is nearly a mile higher than the mile high city at 9600 feet. Many folks don’t take the altitude into consideration when planning their trip, but it is something to keep in mind. Some people will surprise you by not having any symptoms at all, while others will. Symptoms include headaches, stuffiness, cough, trouble sleeping, fatigue, vivid dreaming and the feeling of being out of breath. Severe symptoms are a bad cough, full lungs, confusion and skin discoloration, in which case head to the hospital or an Urgent Care Center. It’s also a good idea to get your oxygen checked if you feel like you can’t catch your breath. Oxygen levels below 90% require supplementation. Many people do feel better after getting a massage and some of our upgrades help. You can supplement your massage with oxygen for $1/minute or $40/60mins. Our high altitude upgrade includes a sinus steam that can help with stuffiness. You can also see our friends at Vida Flow Hydration Station to get an electrolyte IV, which can be a game changer for many people, especially those who overdid it in the alcohol department, which is a little too easy to do at altitude. Some folks come here to relax and absorb the serene mountain environs & sip hot cocoa, while most people engage in activities that they often don’t do at home. This can cause soreness and worse case scenario, injury! Please proceed with your mountain enjoyment, but take the following into consideration. Please take that ski or snowboard lesson, it is so worth it. Consult local mountaineering outfits if you are planning on summiting a mountain, there is important info to know before setting out on the trail. Wear appropriate clothing. In the summer, we dress in layers with outer most layer being a rain coat. In the winter, the layers should not be cotton if you are planning to be on the mountain, good idea in the summer too if you are heading out into the wilderness. Bring plenty of water and add electrolytes if possible. You will likely feel particularly parched in this high alpine environment. Sunscreen is essential since Breckenridge is closer to the sun and those rays burn quick. We recommend a non toxic all mineral variety by Sanitas, which is for sale here if you need it. When the day is done or you are taking a breather, come relieve that soreness with our proprietary arnica oil or CBD balm. You can also take home our arnica bath salts and bathe away the aches to feel your best the next day.